A late winner at the home of previous SCFL premier leaders Horsham YMCA earned Chichester City a 1-0 win that resulted in them replacing their hosts on top of the table. Ellis Martin scored the decisive goal seven minutes from time to put Miles Rutherford's team top of the premier division on goal difference. 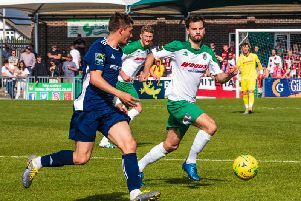 It was one of only five premier division games to survive the wet weekend weather and one of the games to be rained off close to kick off was Pagham's planned clash with Crawley Down Gatwick. They will hope the pitch recovers in time for them to host Burgress Hill in their Sussex Senior Cup third-round rematch this Tuesday evening - the original game was abandoned late on when the floodlights failed. In division one of the SCFL Selsey and Sidlesham were both rained off but Midhurst's game at Alfold went ahead. They might have wished it hadn't as they lost 10-0 - though to their credit they were still big enough to tweet afterwards praising them and their groundsman and wishing them well for the season. In division two Bosham have found some better form of late and they chalked up another three points with a 2-1 win at Worthing Town. Connor Crabb and James Ruston scored the goals that lift the Reds to 11th place.